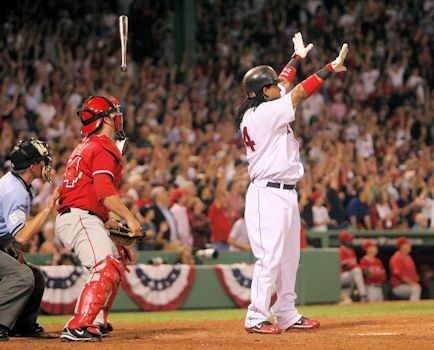 ON THIS DATE (October 5, 2007) ... At 12:44 a.m., 34 minutes after the last train was supposed to stop running in Kenmore Square, Manny Ramirez stood transfixed at home plate, his arms raised overhead, watching as his ninth-inning home run, on a night as warm and clear as an Angel's teardrop, disappeared over the Green Monster and into the mists of Red Sox history. Daisuke Matsuzaka may have been an unsatisfying first course as he failed to make it through five innings, the familiar bugaboo (the gnats were in Cleveland) of nibbling instead of attacking hitters, which drove his pitch count to 96 by the time he was lifted for Javier Lopez with the Sox down, 3-2. The nightcap, however, was epic: Ramirez driving a 1-and-0 pitch from closer Francisco Rodriguez over the wall after the Angels elected to walk David Ortiz intentionally for the second time in the game and the fourth time in the series. Lugo, leading off the ninth against Speier, was on the move when Dustin Pedroia, playing with a shoulder he'd jammed earlier in the game, grounded to short. Rodriguez entered and struck out Kevin Youkilis, then walked Ortiz, who ended the Angels' October three years earlier with a walkoff home run. Ramirez took one pitch, then unloaded, as a crowd of 37,706 erupted in joy that evoked memories of the back-to-back walkoff wins in the 2004 ALCS against the Yankees. Both crafted, naturally, by Ortiz.